With three breweries holding major events, and one popular food and craft beer market hosting an Oktoberfest celebration, it was a Grand Slam for beer around Jacksonville, Florida this past weekend! October 22 had been looming large on the brew calendar, as there were at least four other beerfests around the Sunshine State on the same day. While it may have seemed a daunting endeavor to attend four events in one day, this writer was up to the task, armed with a carefully-planned itinerary, camera, and refillable water bottle. Lead-Off: Intuition Ale Works. Against a sunny sky, I headed north into downtown Jax to the new Intuition Ale Works location on Bay Street, in the Sports Complex vicinity. The amazing venue opened on September 6. 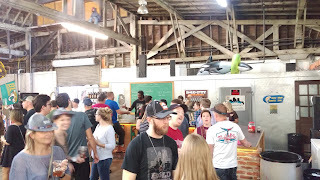 If you haven't visited yet, take a look at my preview story, and you'll see why it's a must-do for your brewery-visit list. I've been here several times already, and I love the open-air seating, spacious tap room and rooftop, and the views-- and, hey the beer is worth the trip, too! Which brings me to the "Backyard Brawl" and the reason for the visit (not that I really need a "reason"). As you already likely know, each year, at the end of October, the University of Florida plays the University of Georgia at EverBank Field in a college football showdown that's known simply as "Florida-Georgia" (or, I suppose "Georgia-Florida", and indeed there are signs around the city using both names). It's a spectacle that has its own weekend, including RV City and a party that's been dubbed "The World's Largest Cocktail Party." 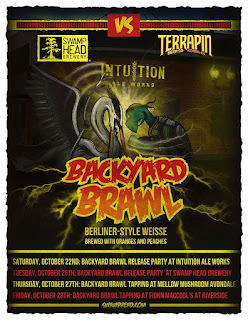 Of course, such a mega event has to have a related beer theme, especially when there's the likes of Swamp Head Brewery in Gainesville and Terrapin Beer Co. of Athens GA. Previously, these two collaborated on the "Bitter Rivalry" beer. 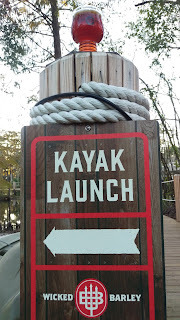 This time around, with the new Intuition Ale Works location, the game takes place literally in Intuition's "Backyard." 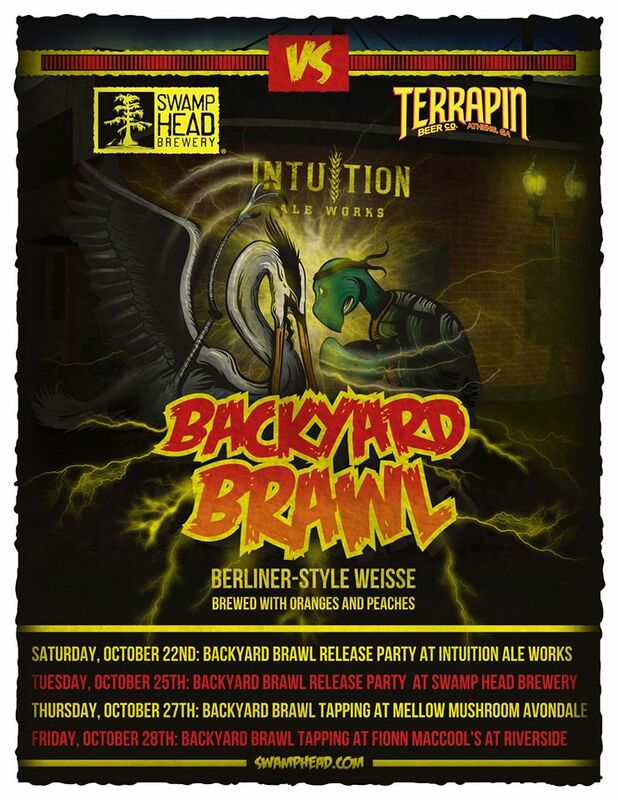 With brewers being the creative types they are, Intuition, Swamp Head and Terrapin got together and brewed up the "Backyard Brawl" Berliner Weisse for the occasion. With a certain amount of fanfare, on Saturday Intuition released the zesty brew made with none other than oranges and peaches, on tap, as well as in a bottle release. 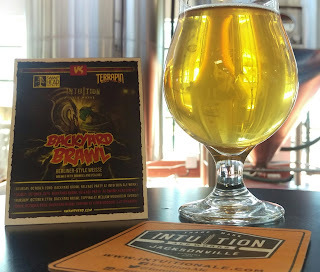 The 4.5% ABV beer is refreshing with just the right amount of tartness that keeps the pucker factor in check, while allowing the fruit flavors to shine through. Grab one and sit outside! 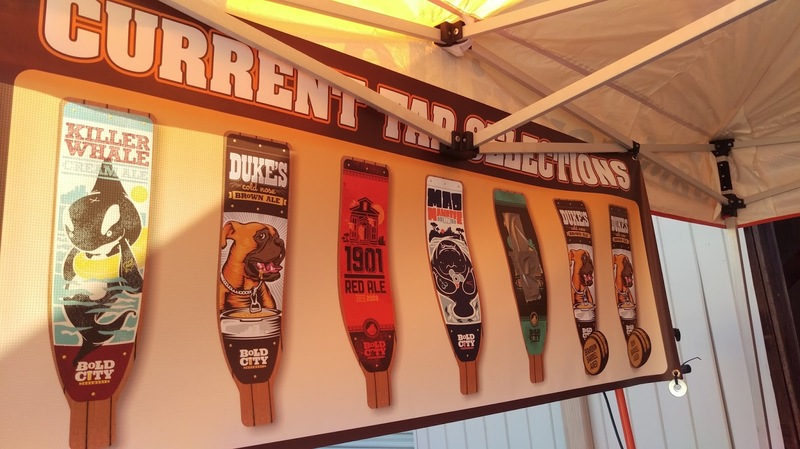 If you're heading to the game, be sure to give this collaboration brew a try. The beer will also be released around Jax at Mellow Mushroom (Avondale) on Thursday and then at Fionn MacCool's on Friday. And, don't worry, Gainesville, Swamp Head is also tapping it, too! Whether you're attending the game or just looking to be part of the festivities, check out the Outdoor Block Party at the Intuition/Manifest Distilling building on Saturday. 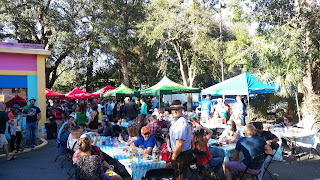 The bash gets going at 10am, and will feature craft cocktails from Manifest, beers from Intuition, a huge projection TV, food trucks, tailgate games, music, and.... additional restrooms! 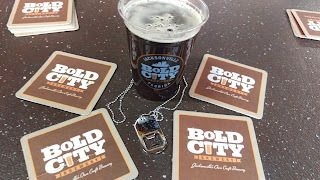 Next up: BOLD CITY BREWERY. 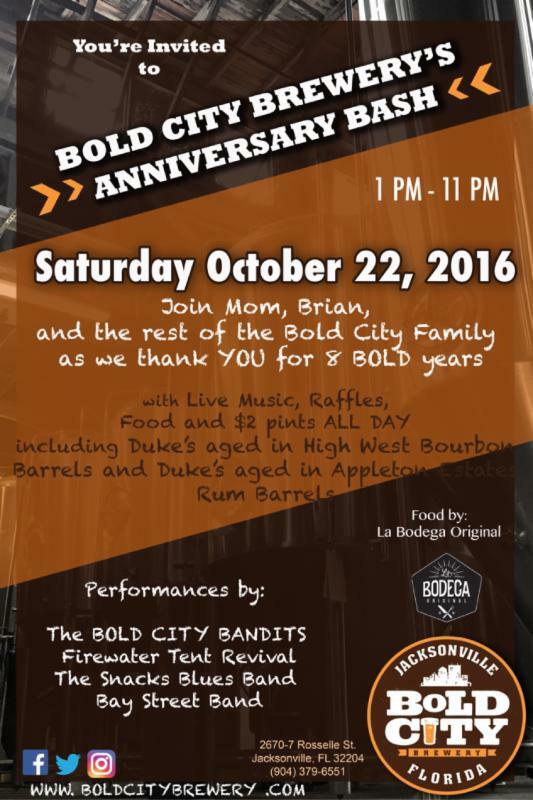 After a short drive through downtown, I then made my way to the Riverside area of Jax for Bold City Brewery's 8-Year Anniversary Party. As expected, parked cars dotted the block surrounding the brewery, and I circled to the back. 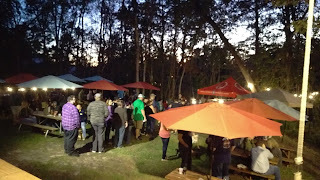 I've attended Bold City's Anniversary shindig for the past five years, and it's always a huge throwdown, attended by what seems like at least half of Jacksonville. With live music rockin' the brewhouse area, three bars serving up the popular Bold City beers, and food onsite, the huge crowd enjoyed their beer outside under clear, sunny skies, inside the tap room, or at the brewery bar. You couldn't go wrong with the $2 per pint price tag, either. Bold City loves its beer fans! And, I think the fans love Bold City, too. Specially tapped for the occasion were two variations of the beloved Duke's Brown Ale: aged in Bourbon barrels, or aged in Rum barrels. 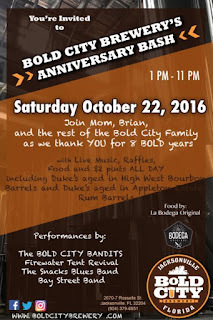 Congrats to Bold City Brewery, and Cheers to Year Number 9! 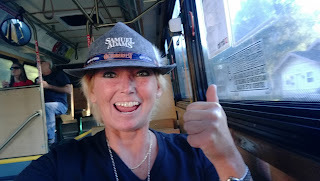 A fun time at E-Street, and then, it was back on the trolley to Bold City Brewery, and off to finish this Grand Slam of Jacksonville events. 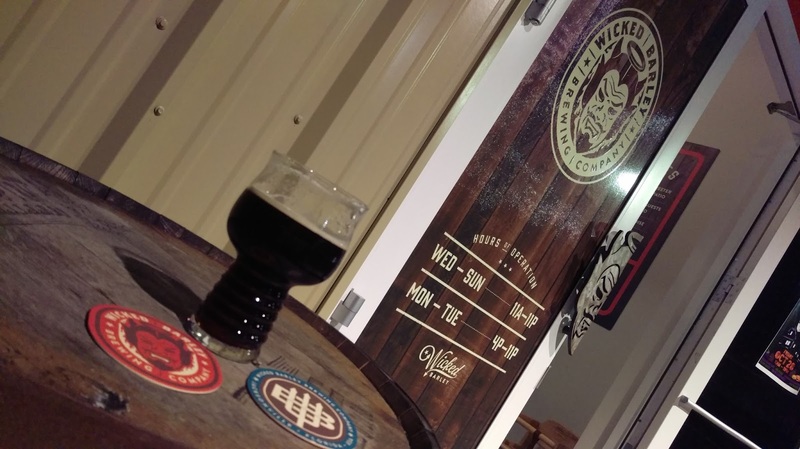 My line-up took me to Wicked Barley Brewing Company for its house beer Release Party. Wicked Barley is Jacksonville's newest brewery (as of now). 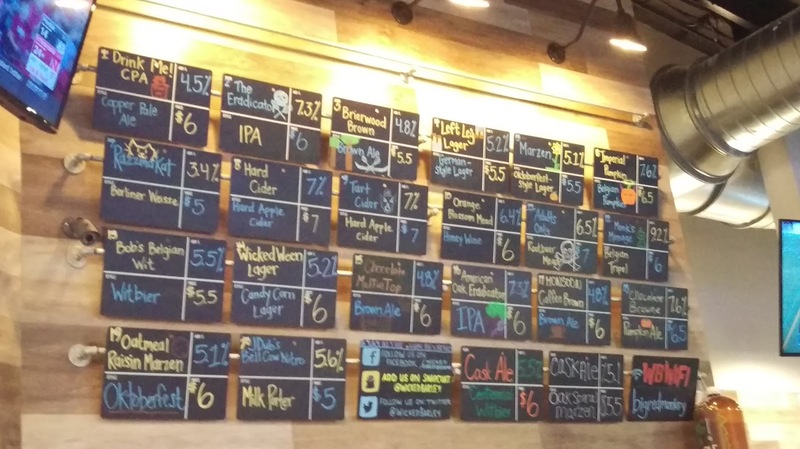 Although it opened in July, it had been serving guest beers on tap -- until now. 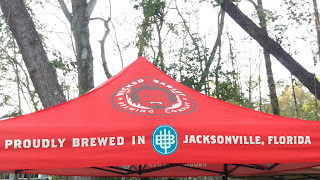 This day was a highly-anticipated event, not just for the brewery crew, but for the Jax craft beer community. (See my preview story for background info). 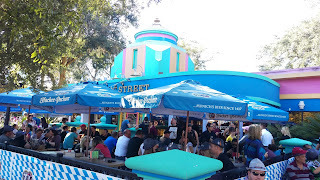 I've been to the brewpub before, and I fully expected a huge turnout, and even though I arrived on the scene later in the day, the place was rockin. 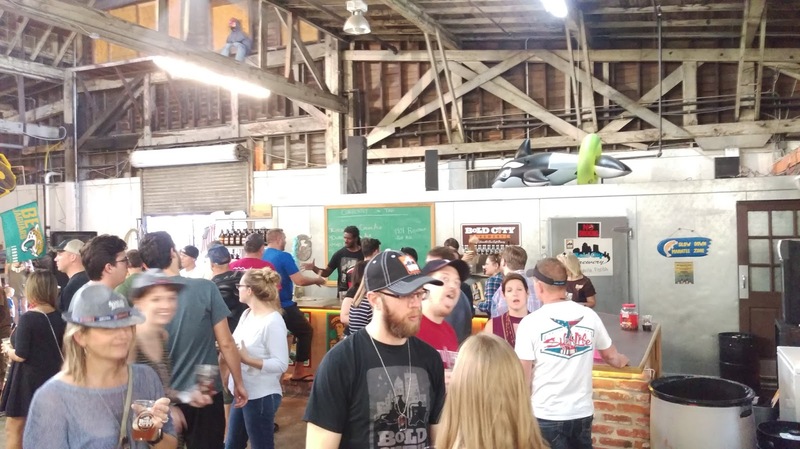 The brewery released a final tap list on Friday night that included not only the core house beers, but also cask tappings, and small batch releases intended to be tapped throughout the day as those kegs kicked. Ciders and meads rounded out the tap list. In addition, the kitchen also released a menu featuring new food items. 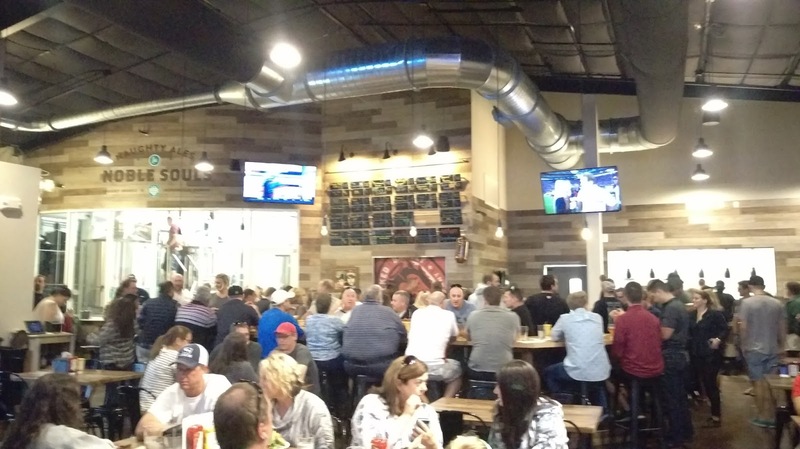 The popularity of the young brewery cannot be overstated, as the dining room, bar, outdoor deck and outdoor beer garden were humming with excited customers. 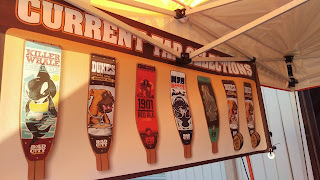 The brewery also offered cans of two of its main brands, Left Leg Lager and Drink Me Copper Pale Ale. Still going strong as the sun set. Oh, yeah...... coffee brown ale! 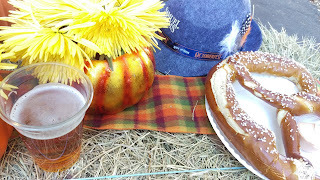 I simply had to start off with the house Oktoberfest, a Marzen lager with a beautiful amber-copper hue and a malty, toasty taste with a hint of sweetness to match. Definitely a good way to start things off! I noticed Co-founder/Brewmaster Philip Maple giving brewery tours in the brewhouse. I managed to get a few words in with Co-founders Tobin Turney and Brett Baker, as they worked through the crowd. Even Brewery Production Manager Fred Thibodeaux stopped to chat, even though his arms were full with empty beer glasses. 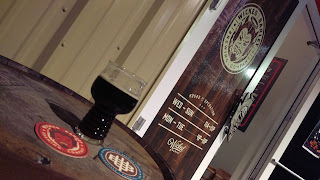 I was lucky to get a glass of the Monsoon Brown Ale - having a definite coffee presence on the aroma and taste, without being acidic or bitter. Shortly afterwards, that beer came off the board. One of the reasons I ended the day here was so that I could try one of the new menu items. 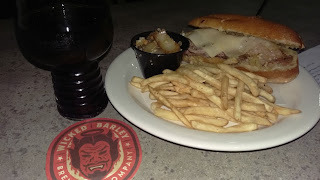 By this time, I found a rare empty seat at the bar and ordered the new Italian Beef sandwich. And, it was also time for the Cubs vs. Dodgers NLCS game! (If you followed me on social media last week, you know that I was in Chicago for Game 2). As the Cubs got some hits and scored off of Kershaw, I was pretty happy, and the new Beef sandwich was pretty sweet, too. The gruyere cheese is complementary, and the onion-pepper garnish provided a very flavorful accompaniment while not overtaking the tender beef. The fluffy roll was perfect for soaking up the juices from the beef and onion-pepper blend. Italian Beef sandwich --- scores. With that, it was time to head back home to watch the remainder of the game. 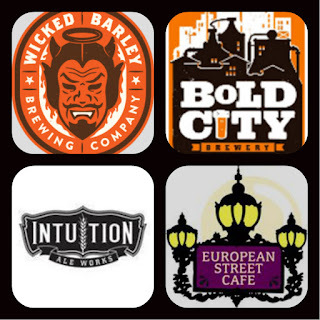 Congrats to Wicked Barley on getting their beers into the hands of the community. Growlers will be available shortly, too. I think we can expect some good things from these guys. 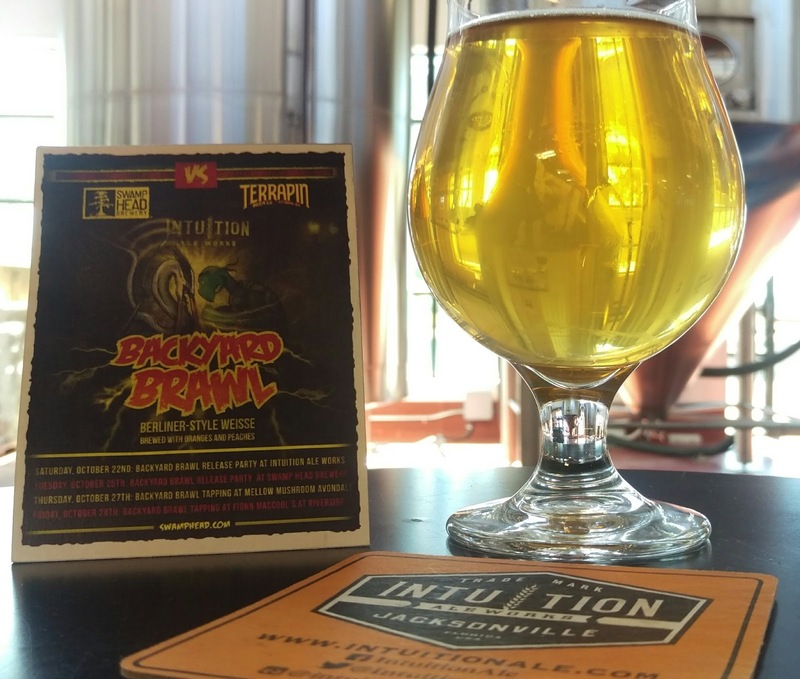 And, the brewpub is hosting a "Wicked Ween" party on Friday, so if you're in the haunting spirit, get your broomstick and head to Wicked Barley Brewing Company. Finally, the Cubs won the NLCS on Saturday night and are headed to the World Series for the first time since 1945 (which they didn't win, and the famous Billy Goat curse became a legend). It's been a whirlwind week! 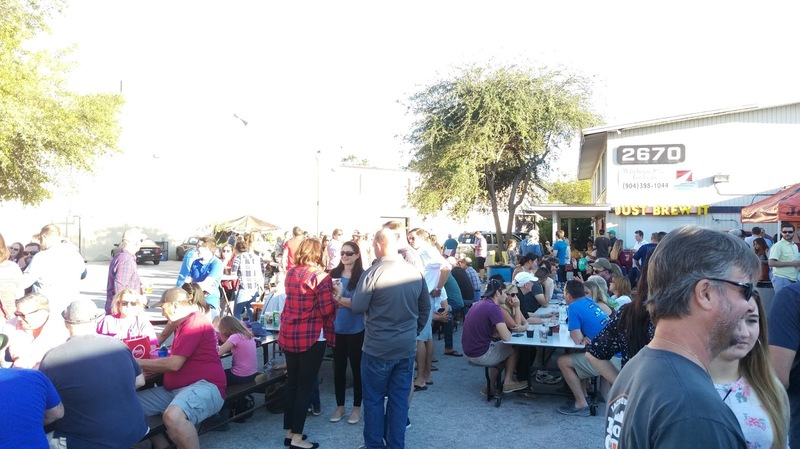 Be sure to check the TAP THIS and BeerSPHERE pages of this website for beer events around the North Florida area and all across the state. There are a number of events happening this coming weekend, including the Florida-Georgia game and festivities, and Halloween events!